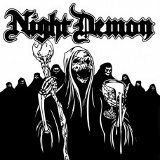 Brand new Californian power trio Night Demon's new self-titled EP is an unabashed celebration of NWOBHM. While there isn't a whole lot of technical ability shown here, the band's over-the-top exuberance and the tried-and-true riffs used rescues the album from oblivion and delivers some cheap thrills that are enjoyable for a few spins. The four songs on the album, while all different from each other, are all very similar to DiAnno-era Iron Maiden, except there is a greater emphasis on themes of Satanism and the occult, which certainly would have been more shocking in the late 70s, but come off as tongue-in-cheek today. Night Demon is actually the worst song on the EP, with lyrics that are lame enough that even if they were ironic, they are painful to hear -- but guitarist Brent Woodward's riffing is good. The following track, The Chalice, doomy and plodding with a swinging beat, is much better, and the clean vocals and chorus of Jarvis Leatherby, the vocalist and bassist, fit very well with the late 70s sound Night Demon tries for. Both Ancient Evil and Ritual are driving and satisfyingly heavy, and the H.P. Lovecraft references only help. In Ritual the vocal delivery approaches a joyous sound -- this is "evil" party rock, especially if one listened to the lyrics and just crossed out all the references to the occult. One of the problems with the power trio format is that Woodward doesn't really get to do much soloing or anything particularly creative on the guitar, but perhaps that's OK. Like a Gama Bomb album, this is an album that's both endearing and frustrating for me; one has to admire the delight of the band in the musical style of an older generation and their fresh take on it, but also wonders how long they can keep it up. However, the impression left is of a garage band that can do some decent songwriting and would probably make for a fun live performance, and there is an excellent chance that with a future LP, they will be able to branch out a bit.